This kawaii (cute in Japanese) set is made of soft long faux fur and fleece. The tail is stuffed with love, care and premium non-allergenic 100% polyester fiberfill. It is all soft, fluffy and light to wear! A ring is firmly attached to the tail to give you the freedom to choose what you can use to attach it. It can be attached to a belt. You can use a carabiner clip, a cloth pin, or whatever you feel it is best to attach it. The ears are made with a loop underneath, and can be used with a headband or a hair pin. You choose the position of the ears! Note that the ears will come always in the two colors, but the colors can be inverted (hot pink on top and purple on bottom, or hot pink purple hot pink, or the opposite. It depends on the cut of the fabric). Tail is about 25" long. 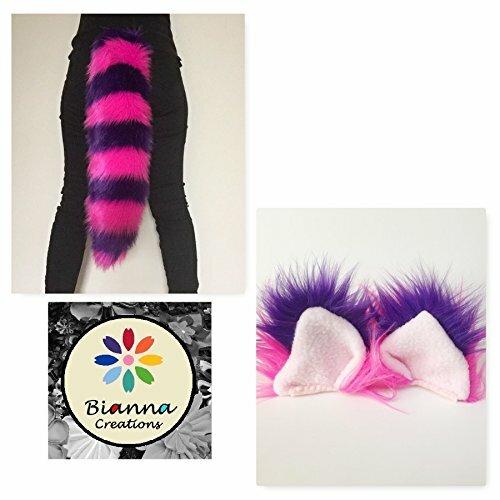 (IMPORTANT: If you need another size of tail, please search: "Bianna Creations Cheshire" to see all the options). Ears are about 3" high (plus fur). If you have any questions about this product by Bianna Creations, contact us by completing and submitting the form below. If you are looking for a specif part number, please include it with your message.